Several years ago, when I started exploring the enneagram in depth, I soon realized it was different from other systems for understanding the self—deeper, richer, and more complex. The figure itself seemed unusual to me. I’d never encountered anything like it before. Its very appearance seemed to suggest that it must be more than just a system for classifying personality types. As I learned more about its origins in the Gurdjieff work, I saw the truth in this impression. In his initial lecture on the enneagram, Gurdjieff stated that “the law of the octave connects all the processes of world creation,” and that “there exists a symbol” that expresses that principle. That symbol, he said, is the enneagram. So Gurdjieff tell us outright that he is unveiling a symbol of great significance—a symbol that was adapted years later by Oscar Ichazo and others as a way to understanding individual differences. An interest in individual differences is what originally drew me to the enneagram. As a research psychologist, I was always drawn to seeing how people varied in their motivations and behavior. How men differed from women, how children differed from adults, and how the same people behaved differently in different situations. When I found the enneagram, I soon realized it was a powerful system for explaining individual differences. Not only did it account for the motives underlying my own behavior, but also how those motives affect my relationships with other people. But I continued to find the enneagram image itself fascinating. I was already familiar with the basic tenets of sacred geometry, particularly the idea that seed ideas can be most economically described by reference to geometric shapes rather than words. In sacred geometry, it’s the image itself that carries information. As a result, when I looked at the enneagram, I wanted to explore the relationship between the image and its ideas. So in addition to studying the enneagram as a system to describe personality, I tried to stand back and look at it as a whole. I started by concentrating on the image itself and what ideas it evoked in me. I drew it by hand and then constructed it on the computer. I looked at its structures—the circle, the triangle, and the hexad. I looked at the angles formed by the lines, at where the lines crossed, and at the number of degrees between the points. I tried to see it in three dimensions, and wondered how to convert points on a circle to areas on a globe. I thought about what it would be like to walk from Point 1 to Point 9—what kind of a journey would this look like? What if I walked it in reverse? Or along the inner lines? What would I experience on my journey? I also started collecting images that seemed to go with each point of view. At first, the collection was purely mental. It consisted of images of the kinds of people I thought of whenever I looked at each point of view. For example, when I thought of Point 1, I started by envisioning the character of the perfectionist that is described by most authors. But as I learned more, I started to see other characters there, too—a lawmaker, a judge, a painstaking craftsman, an ascetic, a scribe, etc. I began to think of each point of view as home to many characters, all related yet distinct. I started to see the stories behind the characters in a story—sort of like participants in a big pageant. I envisioned both the characters themselves and the stories they might tell. I started a mental list of these characters or personas. When it grew too long to remember, I started writing it down. Generating this list added depth and texture to my understanding of the enneagram. As the list got longer and more diverse, I began to see how each of these characters reflected the creative potentials that can be lived out through our lives. I realized that each time I step into a different role, different creative possibilities come into play. make me grow beyond what I already know. These roles that call forth a creative response are the ones that give my life shape and purpose. Together, they comprise what could be called a dharma, life theme, or life path. Actually discovering the life path often takes a bit of doing, because we have to try out quite a few roles before we get a sense of which ones really suit us. Studying the enneagram is one good way to narrow down the possibilities. However, using the enneagram as a tool to find a life path means looking at it in a way that’s more transpersonal than personal. This is because the concept of a life path involves looking not only at the path itself, but at the way it connects with other paths and at the landscape that the path traverses. So in seeking a life path, we’re trying to discover the proper relationship between ourselves and the larger web of life. From this perspective, our enneagram type is not equivalent to a personality type. By definition, a personality type focuses on individual differences only on the personal level. But individuality can exist at many levels, as spiritual practitioners such as Ken Wilber or Swami Muktananda make clear in their writings on the nature of consciousness. If we want to use the enneagram as a way to explore life paths, we have to focus mainly on relationships—how the life paths typical for each point relate to the life paths of other points and how all of them converge in a mysterious way to create a meaningful whole. From a transpersonal perspective, our enneagram type can be likened the clothing we wear in order to fulfill a particular purpose in life. Some of us put on business suits, while others are dressed like gypsies, soldiers, fools, or divas. Our dress depends on the roles we play. And the roles we play never exist in isolation, but are always part of a larger drama. It’s the transpersonal nature of individuality that makes it possible to speak of the enneagram in terms of Holy Ideas. The Enneagram of Holy Ideas focuses on the nature of the points of view as they exist in the absence of personality. A. H. Almaas writes extensively about the Holy Ideas in his book, Facets of Unity. Almaas points out that, “the nine [Holy] Ideas can be understood as [nine] differentiated ways of seeing” (p. 59). In a recent talk at the 2005 IEA conference in San Francisco, Almaas said he conceives of the enneagram type structure as something that’s present at birth (prior to social conditioning), and that does not go away, regardless of how much inner work we do. If this is true, then it’s important to find ways to talk about individual differences in a way that doesn’t imply that they necessarily are the same things as personality differences. One way to do this is the way that it’s been done up to now in the enneagram community, which is to talk about the Holy Ideas. The only problem with this approach is that the phrase Holy Ideas is remote, abstract, and obviously religious in orientation. I get the sense that it was originally devised as a way to stress the difference between fixated (egoic) thought forms with non-fixated (non-egoic) thought forms. And for this purpose, it works well. But for exploring the idea of life paths, it’s not necessary to focus on the extreme ends of the spectrum. In fact, it’s a disadvantage. Since seeking a life path means seeking to be in “right relationship” with life, we need to find ways of speaking that stress the nearness of the transpersonal world, not its ineffability. That’s why I think that there are advantages to speaking of enneagram archetypes. The idea of an archetype is transpersonal yet psychologically accessible. When I think of archetypal figures like the Hero, the Trickster, Earth Mother, or the Hermit, I see them as larger than life (transpersonal in nature), yet no so much larger that I can’t relate to them. I find it easy to see how these characters show up in my life and the lives of people I know. However, each of these high-level archetypes that gives rise to many “lesser” (more concrete and narrowly-defined) archetypes. While these archetypes are diverse, at the deepest level, they share a common theme or thrust. The energy of the master archetype is intelligent, vibrant, and alive. While it’s pregnant with creative potential, that potential can’t manifest in the physical world all by itself. This can happen only when the energy is embodied in the heart, mind, and hands of a human being. The sense I have is that, when a human being incarnates, she becomes particularly responsive to the energies of one of nine major archetypes. This becomes her enneagram (arche) type. As such, it’s the one that exerts a dominant influence on her character. It does so very simply: by structuring her view of the world in a particular way. The structure it imposes seems so basic and natural that she tends to become personally identified with it. The archetype provides the creative energy she needs to participate in life; in effect, it “sponsors her trip to Earth.” The individual reciprocates by grounding the energy of the archetype by expressing it in her daily life. When it works the way it’s supposed to, there’s a figure-8 flow of energy between the archetypal world and the physical world. Life becomes infused with magic and light. That’s what happens when we really find our path in life. We tap into that magic flow and begin to resonate with the natural rhythms of everything around us. We surf the wave instead of getting inundated by it! When we understand how energy flows between the archetypal and physical worlds, it’s possible to see how the roles we play bring the energy of the archetype into everyday life. At the same time, it’s not always easy to fully incarnate this energy. To do so, we have to be willing to allow the energy to flow through us without getting in the way all the time. At the same time, we have to take full responsibility for what we do in life. That’s why the art of living is a lot like surfing. Surfing is great fun, but only if you develop a pretty keen sense of timing and balance! Not only that, but graceful living also demands the ability to live with limitation, because life on earth is by its nature limited in so many ways. But we might want to ask ourselves whether seeing things as they really are is really such a great thing. We might want to consider the possibility that having our perceptions contained has certain benefits we haven’t fully appreciated. If the type structure is a perceptual filter, it will both limit and bias our percepts, so that (1) we attend to a limited number of things around us and (2) we attend more easily to those aspects of life “favored” by our particular point of view. From life’s perspective, this limitation creates diversity, and diversity has intrinsic value: individual variation adds more richness and texture to the fabric of life as a whole. From the perspective of the individual, the limitations that we encounter represent opportunities for creative growth. This sounds good on paper, but most of us don’t respond enthusiastically when we realize we’re being limited in some way. We tend to think of limits as a restriction on our freedom. As such, they seem like the enemy. If the limits won’t budge, we get frustrated. Our attention tends to get fixated on them. Our emotions start churning. We get upset. Once we’re stirred up, our perceptions narrow even further. It’s easy to get so caught up in focusing on the walls around us that we don’t even notice the space they enclose. It’s this inner space that intrigues me. Every enclosed space represents a mini-universe. Some universes seem larger than others, but all of them are bounded in some way, because nothing in manifestation is completely unbounded. Even people who we call enlightened do not live in an unbounded universe. There are always constraints of one type or another. is especially limited—it turns out that we can hang onto only a very small amount of information at one time, usually between four and nine separate “chunks” of information (often closer to four or five). The scientists who study this stuff are split into two camps, the pessimists and the optimists. The pessimists tend to focus on the negative implications of our cognitive apparatus, stressing the ways into which it leads to errors of judgment or loss of information. The optimists tend instead to focus on the ways in which we compensate for our limitations. I decided early in my training that I preferred the optimist position, probably because of my interest in creativity. It’s always seemed to me that human beings are extremely ingenious when it comes to dealing with cognitive limitations. Although we can’t actually change the limits themselves, we are able to develop ingenious workarounds—workarounds that enable us to handle complex data sets and solve difficult problems. For example, we develop hierarchical ways of organizing information, so that we never have too many things to recall on the same level of organization. We record things in writing, so we don’t have to keep so much in long-term memory. We decrease the complexity of tasks by task sharing, delegation, or paring down problems to their bare essentials. These ways of working don’t eliminate the constraints, but they do change the effect of the constraints. Although we’re said to function like “limited capacity processors,” we don’t notice our limitations most of the time. Most of us are able to work around our limitations so seamlessly that we don’t even realize they exist. The way we think seems natural to us, not constricted. We don’t see the limitation there, because we’ve developed creative ways to work with it. Our attention is not on the limitations, but on the remaining possibilities. This is particularly true of experts in a field. To be an expert, you need both a thorough knowledge of the territory and the ability to creatively use what you know. People become experts by intensively focusing on what is possible within the boundaries of their field. They’re intuitively aware of limits, but that’s not what they focus on. A good example of this way of operating is seen in the film Apollo 13. This film is a chronicle of the actual events that took place on the Apollo 13 moon landing mission. Halfway through the mission, the mission astronauts are forced to abandon the main spacecraft and travel home in the lunar excursion module (LEM). But there’s a problem—the air filter on the main spacecraft is round while the one on the LEM is square. Unless someone can literally figure out how to put a round peg in a square hole, the astronauts are doomed. NASA calls upon M.I.T. engineers to solve the problem using only materials available on the LEM. Time is short and the outcome is critical. The M.I.T. engineers have very little to work with. Yet they manage to devise a makeshift connection that really works and tell the astronauts (who are dingy from oxygen deprivation) how to assemble it. If this story were fiction, no one would believe it. But it really happened. It shows the power of focusing on the possibilities instead of the limits. Artists are well-aware of the power of limits. An artist always works within the space created by the limits of a particular medium. For example, working with different materials—pen and ink, pastels, oils, or acrylics—creates a different work space. Depending on the medium, certain effects become easier to achieve while others become more difficult. Artists often, if not always, find themselves working with tricky tools and intractable materials, with their inherent quirks, resistances, inertias, irritations. Sometimes we damn the limits, but without them, art is not possible. They provide us with something to work with and against. In practicing our craft, we surrender…to letting the materials dictate the design (pp. 80-81). From this perspective, limits aren’t the enemy, but simply the means of defining a domain. They’re not only necessary, but helpful, because without them, “art is not possible.” Without a constraining medium, nothing can happen—nothing new can come into the world. If certain values are constrained within narrow limits, others are free to vary more strongly. Thus, for example, string quartets, solos, and other limited forms may achieve greater emotional intensity than symphonies, and black-and-white photography may achieve greater power than color. In ragas, or solo jazz play, sounds are limited to a restricted sphere, within which a gigantic range of inventiveness opens up. If you have all the colors available, you are sometimes almost too free. With one dimension constrained, play becomes freer in other dimensions (p. 85). Here Nachmanovich argues that imposing limitations on an artistic genre encourages creativity instead of inhibiting it. These limitations create the protected space in which creation takes place. They also make possible an intensity of focus that would be impossible to otherwise achieve. Without a defining genre, art lacks both form and substance. Most of us can grasp these ideas of how limits might help an artist in her work. But Nachmanovich isn’t just talking about art, he’s talking about life. He says so right in the title of his book, Free Play: Improvisation in Life and Art. In the I-Ching, limitation is symbolized by the joints in the bamboo stalk, the bounds that give form to the artwork and to the life. The limits are either the rules of the game to which we voluntarily accede, or circumstances beyond our control that demand our adaptation (p. 79). So both Nachmanovich and Bruner see limits in a pretty positive light. Limits are regarded less as an enemy to be defeated than as a goad that elicits our creative adaptation. But the way of adaptation is alien to people in Western cultures, as I alluded to earlier. This is especially true in the culture of the U.S., where our forefathers tamed the wilderness and our fathers moved on to taming the corporate world. It seems to me that, as a culture, we tend to consider adaptation shameful because we associate it with either incompetence or lack of moral fiber. Maybe this is why encountering the enneagram for the first time can evoke a sense of shock and dismay—what some people call the “Yuck!” factor. You’d think that we’d be overjoyed to find a system that offers so much self-insight. But typically, we have mixed feelings. The enneagram shows us three key things that we may find hard to face: (1) that our objective view of the world is actually subjective; (2) that our individual motives may be traced back to one of just nine archetypal patterns; and (3) that no matter what we do, there’s no way to entirely “break out” of the limits imposed by our type. For better or worse, our enneagram type is with us for life. This discovery is humbling. It shows us that the gift of free will doesn’t confer unlimited vision. And this discovery strikes at the heart of some of our most cherished beliefs about ourselves and our culture.4 It can make us feel that we’re in a one-down position, trapped by a personality self that seems to defeat the efforts we make to manage our lives. But is it the personality self that’s the problem or the attitude we adopt toward the personality? If we hate limitation, and see the personality as an instrument of limitation, then we may see our enneagram type in quite a negative light. It’s as if our reluctance to accept limits can make us believe that the limits shouldn’t exist. If they do, we may take it as a sign that something is seriously wrong. However, both Stephen Nachmanovich and Jerome Bruner seem to be saying that limits are not the problem—that real freedom lies not in the absence of limits, but in our ability to creativity work within those limits. The limits imposed by enneagram type aren’t just a goad to creativity, but have other important functions, too. I can easily identify two of them: (a) an energy management function and (b) a spiritual function. From an energy management perspective, our enneagram type lends support to the mental structures that enable us to function in everyday life. It helps shape the perceptual mechanisms that filter incoming information and the cognitive mechanisms by which we form mental impressions and make decisions. Without such mechanisms, we’d have no way to focus on anything from a single perspective or to distinguish foreground from background. We’d experience life as though we were on a never-ending acid trip. Most of us take this ability to focus for granted. But it’s possible to lose it. When this happens, we feel overwhelmed by ordinary stimuli. Life becomes a bewildering barrage of sensations that we can’t sort out. This can happen not just to the mentally ill, but to the spiritually awakened (especially to those who awaken very suddenly). That’s why the line between psychosis and enlightenment can be difficult to discern. In either scenario, the person involved can find it hard to hang onto a single point of view for any length of time. It’s easy to idealize spiritual states (states of expanded awareness). But there are practical reasons why we might not want to get “stuck” in spiritual states all the time. The gain in breadth of vision represents a loss in specific focus. It makes it hard to drive a car or enjoy a hug from our kids. The type structure can be viewed as an ingenious mechanism for squeezing as much consciousness as possible into a mind/body that’s normally vibrating at a pretty slow rate (simply because it’s physical). It’s possible to envision the type structure as a transformer that steps down the energy to a manageable level. It not only steps the energy down, but focuses it in a particular way, so that certain things becomes more salient than others. So if I’m a One, for example, what is salient is what is correct. If I’m a Two, what’s salient is what helps me connect with other people. If I’m a Three, it’s what helps me achieve my goals. If I’m a Four, it’s what’s authentic. If I’m a Five, it’s what increases my understanding. If I’m a Six, it’s what protects me. If I’m a Seven, it’s what stimulates me. If I’m an Eight, it’s what I master. If I’m a Nine, it’s what brings harmony to my life. If a human being can only handle a certain amount of energy in any given moment, then in order for that human being to focus deeply on something in particular, there has to be a mechanism that screens everything else out. The type structure is what provides this mechanism. By screening out every perspective but one, it enables us to expand our awareness from one particular perspective. This is what Nachmanovich is talking about when he says that it’s the constraining of values in one direction which enables them to becomes stronger in another direction. From a spiritual perspective, it’s possible to see our enneagram type as a source of inner guidance. If this idea sounds funny, maybe this is just because we often use words to describe type that suggest we’re talking about something inert—like a structure, category or container. But when we think about what each type represents—a unique motivational thrust—it’s obvious that this motivation can’t exist in a vacuum. Any structure that’s purpose-oriented must by definition be dynamic and intelligent in nature. Those of us interested in spiritual life are seekers of inner guidance. aren’t we? Well, here it is—very definitive inner guidance that can help us find our way in life. The reason it may be hard to recognize type as a source as guidance is that it’s so innate—because it operates at the level of our most basic perceptions and cognitions. Also, it has an impersonal (or transpersonal) quality that we don’t usually associate with the idea of guidance. But when you really think about it, our enneagram type often has a profound effect in shaping the life paths we walk and the roles that we play in life. If this isn’t inner guidance, what is? The idea of type as an inner guide may also sound strange if we see type as a simply a subset of the personality. Obviously, if type is just part of the personality, it’s not likely to be a source of deep wisdom. But if type is really transpersonal—as I think it is—then that’s a whole different story. Remember that A.H. Almaas speaks of the types in terms of Holy Ideas. If each type is really Holy in origin, then it must carry within in a divine spark of inspiration. Nevertheless, as a vehicle for nudging us in the direction we’re meant to go, the structure of type can be helpful. By making it difficult to perceive things from more than one perspective, it pushes us to cultivate openness to the views of other people. It gives us the chance to develop both attentiveness and adaptability. Potentially, the limits it imposes encourage us to adapt to life instead of battling it. To the extent that we’re able to learn the art of adaptation, we begin to experience life in a new way—as a flow or dance. Human factors researchers call this ability to adapt situational awareness. When we have a high degree of situational awareness, we’re instinctively aware of three things: ourselves, the situation around us, and the dynamic interaction between the two. Knowing the self means perceiving the roles we play and the reasons we play them. Knowing the nature of the situation means noticing which story or drama that we’ve walked into. And knowing the relationship between the two means seeing how to position ourselves within the story—what role to play and how to play it. Encountering the enneagram was what sparked my interest in life paths. That’s because it focuses so much on differences in motivation. And to me, differences in motivation imply differences in life purpose. But initially, I was looking more at social roles than life paths. That’s because enneagram authors tend to describe differences among the types by identifying a distinctive role for each type. One thing I noticed right away was that almost all of these authors chose just one role to exemplify each type. I also noticed that not all the authors chose the same role. I found this discrepancy interesting, because it meant that the idea of type was more multifaceted than it initially appeared. As I got a little more familiar with the types, I began to understand these facets. I realized that because each type reflects an archetypal motivation (rather than a single role or pattern of behavior), the same general motivation could be the underlying impetus for many different roles, any of which an author could choose to emphasize. I was curious how different authors characterized the same types, so I compiled a table to compare the different words used to talk about each type (see Table 1). I noticed several interesting things about this list. First, authors vary in what it is that they’re trying to describe. Some describe a prototypical persona (the Helper at Point 2) while others try to capture the “atmosphere” of the point (Knowledge with Withdrawal at Point 5). Second, authors they vary in their attitude toward type. Some authors focus on the positive aspects of type (The Loyalist at Point 5), others on the negative aspects (Ego-Indolence at Point 9), and still others on a combination of the two (Angry-Virtue at Point 1). Fourth, some of the terms changed over time. For example, I know from work with the Palmer & Daniel’s Tri-fold School that Palmer’s original description of Point 6 as the Devil’s Advocate evolved into Palmer’s Trooper and thence into Daniel’s Loyal Skeptic; similarly, the Tragic Romantic became simply the Romantic (thank goodness for us Fours!). Fifth, even if is we limit ourselves to looking only at the persona labels (see Table 2), there’s not much agreement on the best term for personifying the types. At Point 3, we have not just the Achiever, but also the Performer, Succeeder, and Doer-Achiever. Other points has even more descriptors: at Point 6, we see seven different roles: the Devil's Advocate, Questioner, Guardian, Trooper, Loyalist, Loyal Skeptic, and Skeptic-Perfectionist. No point has fewer than three descriptors and both Points 6 and 8 have seven each! Each of these descriptors evokes a somewhat different image of the type. It’s funny that although most of us agree that each point of view does possess a unique quality, trying to find a single label that captures this quality turns out to be a challenge. That’s why most enneagram books include lengthy descriptions of each type that attempt to flesh out the brief type descriptors. Still, I found the idea of summarizing types in terms of key roles an intriguing idea. This is how I became intrigued with subtypes (aka instinctual variants). Looking at each type in terms of the three arenas in which it shows up in life—the self-preservation, sexual, and social arenas—triples the number of roles for each type. I talked with Katherine Chernick and David Fauvre and poured over their and their study on subtypes. I looked at Peter O’Hanrahan’s enneagram workbook, which has a lot of subtype information, including a nice table in which he lists two descriptors for each subtype (plus a brief description). The first label is a persona label that he devised himself and the second is a description of the quality most associated with that subtype. The latter terms are inherited from the Arica teachings of Oscar Ichazo (see Table 3). However, nothing I saw encompassed the range of possible personas I could envision for each subtype. So I generated my own list of roles, organized by subtype. It remains a work in progress, but it’s now sufficiently long to serve as a useful tool. 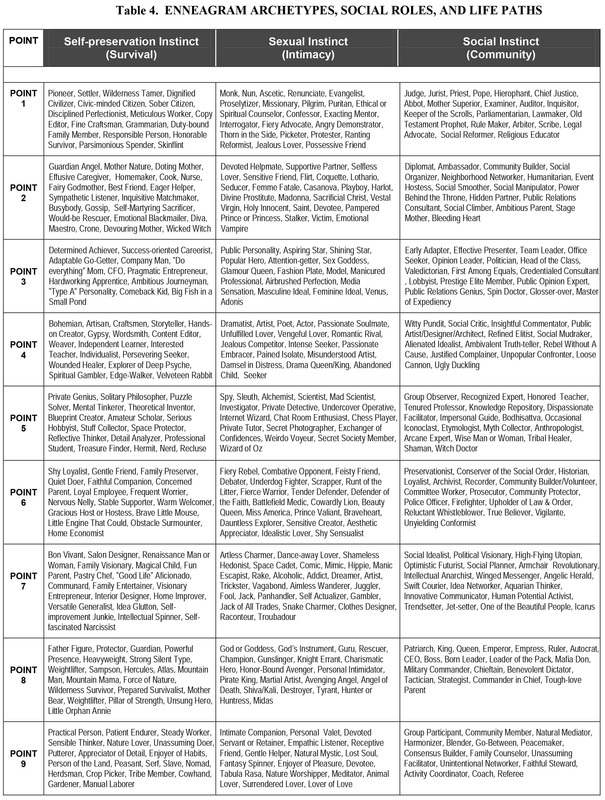 The personas in Table 4 vary a lot in their nature—some of them are more classical or archetypal in nature (Trickster, Hero, or Alchemist) while others are more contemporary, career-focused, or “everyday” (Salon Designer or Committee Worker). These personas all imply life paths of a kind, although some are more all-encompassing or universal than others. Some of the images are likely to show up in outer life, while others are more likely to remain as inner personas. Many of the inner personas that speak the most eloquently to us do show up in some way in outer life, as the personal or professional roles we take on. But there’s a lot of individual variation in how these personas speak to us. It’s important to note that although I associate each persona with a particular subtype, I’m not trying to suggest that only people of that subtype can experience that persona (that someone has to be an intimate Four to be a Poet or a social Six to be a Police Officer). However, I am suggesting that people of a certain subtype will probably resonate with more of the roles listed for that subtype than people who are of a different subtype. Take my own inner personas, which include an Inner Explorer, Gypsy, Psychologist, Edge-walker, Artist, Craftsman, Scientist, Critic, Helper, Organizer, and Skeptic. The first six of them are directly linked to my type and subtype: Self-Preservation Four. The Scientist reveals my Five wing, and being a Cognitive Psychologist really clinches the connection to Five. The Critic can be attributed to either the social subtype of Four or the connection to One. The Nurturer comes from the connection to Two (and self-pres. Two, at that—I love to bake for friends and family! ), the Skeptic comes from my father, a Six; it’s also resonant with the Scientist of my wing. This list is not exhaustive. I doubt that it ever will be. But I hope it’s at least evocative. I see each type as multifaceted, and I wanted to present as many of its faces as possible, instead of just one or two. Some of these faces are kind, others cruel. Some are grand, others ordinary. Some are modern, others ancient. There are no value judgments here. Since I consider type to be transpersonal, I consider the personas we take on to have transpersonal or archetypal quality, too—even the modern-sounding or prosaic ones that we’d never find featured in Bullfinch’s Mythology (e.g., Servant, Helper, Clerk, Caretaker, or Committee Member). I was talking with a friend about this—about how ordinary roles never seem to have the status that dramatic roles do. She observed that Trivia is the Goddess of the Crossroads. I asked what she meant, and she said that the roles that lack status (that seem ordinary or trivial) may actually be the most essential, because they’re the ones that “stand at the crossroads.” They’re the ones that tie together the social fabric, often in ways that are unseen and unappreciated. The value of such roles is actually inestimable, because when they’re not fulfilled, the social fabric starts to unravel. The low status we accord them may be due to their feminine character, which is why we don’t see them in heroic literature. This seems like an important point, because we live at a time when our failure to appreciate the ordinary is bringing us to the brink of disaster. About the same time my friend told me about the Goddess of Trivia, I had a dream in which I knew I was on the plane of the archetypes. But all I saw there were ordinary-looking figures walking along a street, not doing anything the least bit heroic or special. They seemed completely nondescript. Despite their ordinary appearance, the vibrancy of their being literally knocked my socks off. They were intensely present and alive to the moment. This dream showed me that what makes an archetype is not a special role, but a quality of being. As such, it’s something that anyone can cultivate. Shadow roles may be hard to look at, but they are just as much a part of us as other roles we play. Acknowledging them as ours is what helps us become integrated. It’s when we can’t or won’t see them that they start haunting our dreams or creating symptoms that show up in outer life. From a dramatic standpoint, Shadow personas often a critical role to play, one that cannot be played by anyone else. Witness the part of the pathetic Gollum in Lord of the Rings. Frodo is the Ordinary Hero (a Nine-ish persona), the “Everyman” who trods the long path to its end, only to find that when he gets there, he’s unable to do what needs to be done. It’s Gollum, not Frodo, who makes the final critical move that brings the story to a decisive conclusion. Approaching the whole idea of story and roles with a little bit of humor has been helpful to me. To see what’s there without getting hooked by my own value judgments about what I like or don’t like about what I see! 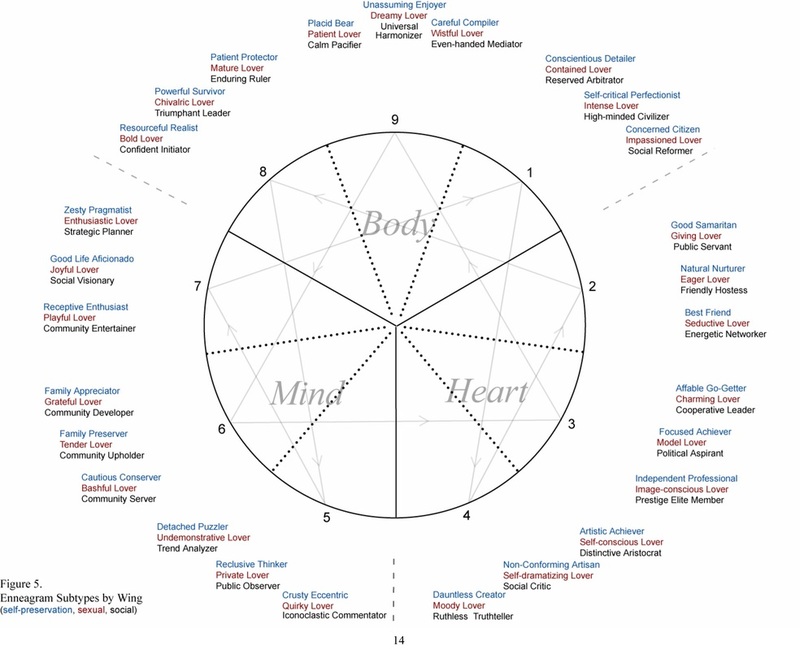 I like to use this matrix as way to spark new ways of thinking about the enneagram and to give people yet another tool for discovering their type. I showed it to a friend who’d never seen the enneagram and she accurately picked out her type and subtype in a few minutes. One thing I discovered is that although this 27-box matrix worked well for what I was doing, there are some descriptors that just didn’t fit that well into the category of a single subtype. Some are broader than that, like the ones that we use to describe type overall such as the Perfectionist or Achiever. In addition to “too broad” archetypes, I also had a problem with “too specific” archetypes, such as those that are most apt when we’re talking about just one wing of a subtype. A case in point is the Coach and Referee personas that are particularly apt for Point 9w8 9 social subtype, rather than Point 9 per se. Another is Little Orphan Annie, which seems to me like a self-preservation 8w7. While I excluded the “too broad” roles, I usually included the overly specific roles (that lean toward one wing more than the other). favorite descriptor for Type 3 is the “Chameleon,” because they are so great at adaptation. But when someone is a chameleon, it’s hard to say what this looks like, because it changes depending on the context. Many of the descriptors I finally chose involve business and political roles because we live in a democratic consumer culture which rewards people who excel in those domains. But Threes who live in cultures with other values would likely be attracted the social roles that enable them to shine, whatever these may be. Also, Threes whose interests or values diverge from the mainstream would tailor their talents to the areas that interest them. I was talking recently with a Three who’s interested in esoteric studies, and his interest is in gaining recognition in that area, not in mainstream culture. Still, many of the Three subtype descriptors (e.g., High-Rising Achiever or Team Leader) can be applied in many different domains. Since my interest is in looking at the enneagram in terms of creative potentials, I like to generate lots of ways to look at personas. So in addition to exploring all the different roles possible for each subtype, I’ve been exploring how the different personas “shade into” one another as we move from Point 9 to Point 1 to Point 2, etc. This has already been explored to some extent by authors who like to explore the wings (e.g., Riso & Hudson and Tom Condon), but I did it in a more detailed and graphical way. First, I divided the wing types by subtype, which gave me six subtypes per type (e.g., SP 1w9, SX 1w9, SOC 1w9, SP 1w2, SX 1w2, SOC 1w2). Then I added one more set of three subtypes per type that showed the “bi-winged” personas. 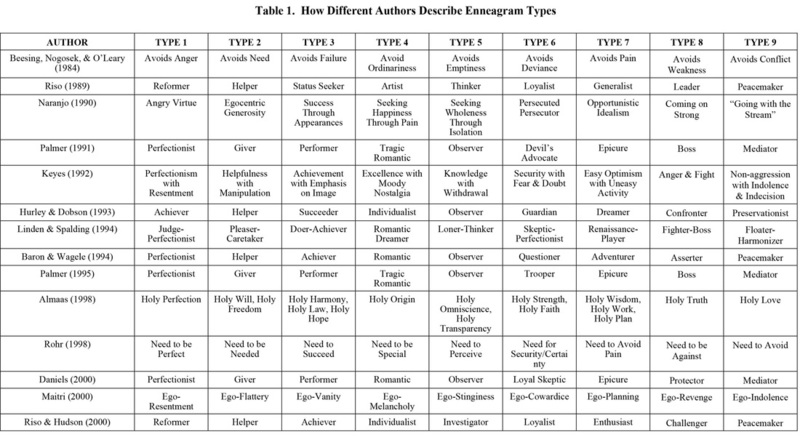 Last, I placed all of these personas on the enneagram (see Figure 5). The top line (in blue) is the self-preservation subtype, the second line (in red) is the intimate subtype, and the third line (in black) is the social subtype. Seeing the descriptors graphically depicted helps me see the relationship of types and subtypes on the outer circle of the enneagram. In the enneagram community, we’re used to talking about the flow along the inner lines. But there’s also a flow along the outer lines. Arranging the subtype descriptors along the outer edge makes it easier to see the nature of that flow. I also like to work with this list to explore the relationship between “lookalike” types. Many lookalike types can be distinguished by looking at subtype, and this figure is helpful in that regard. Take Sixes and Ones. Both types tend to be industrious and responsible. But Ones are “anger types” while Sixes are “fear types.” I tried to pick descriptors that captured this difference. I describe the One as a High-minded Civilizer and Social Reformer. These terms are designed to convey the sublimated fire that fuels this point of view. I describe the Six, however, as a Community Server and Family Preserver. These descriptors emphasize the desire to join with a group in order to ensure mutual help and protection. I also tried to show how moving from one point to another (and one center to another) subtly but definitively shifts the focus. For example, moving from Seven to Eight represents a shift in both point and center. The self-preservation 7w8 is a Zesty Pragmatist while the self-preservation 8w7 is a Resourceful Realist. The intimate 7w8 is an Enthusiastic Lover while the 8w7 is a Bold Lover. The social 7w8 is a Strategic Planner while the 8w7 is a Confident Initiator. The point change means a shift from enthusiasm to dominance. The center change means a shift from mental to instinctual energy. I tried to use language that would reflect these kinds of shifts. It was hard for me to select just one label for each position, because of my strong sense that no one label can really capture all the aspects of that position. But it would just be too confusing to have multiple labels, so I have to settle for one. In the end, it doesn’t matter that much. Both the table and the diagram aren’t designed to be definitive, just evocative—to stimulate thinking and evoke an imaginative response. This is the way I like to work with the enneagram. Other approaches I find interesting include looking at the themes and stories associated with each type (as Tom Condon and Judith Searle are doing), working with visual images of type (as Katherine Chernick and David Fauvre are doing), and exploring the relationship between the enneagram of individual differences and Gurdjieff’s process enneagram (one of my current projects). I’m interested from hearing from anyone with similar interests. 2 See Mind Over Machine, by Hubert & Stuart Dreyfus, for more on novice vs. expert decision making. 3 Acts o f Meaning, by Jerome Bruner, p. 21. 4 See Thomas Sowell’s A Conflict of Visions, for an interesting hypothesis regarding the constrained vs. unconstrained visions of human nature. 5 For a discussion about problems connected with ungroundedness in states of expanded awareness, see, e.g., p. 183 in Halfway Up the Mountain, by Marianna Caplan (on the problem of getting trapped in high spiritual states), pp. 83-160 in Darrell Irving’s Serpent of Fire (on how to tell the difference between kundalini awakenings and madness), and Chapter 7 in Hilary Hart’s The Unknown She (for a first-hand account by mystic Lynn Barron of what happens when a spiritual awakening blows apart the psychic container). 6 In the book Daugher of Fire, Sufi disciple Irina Tweedie recounts her experiences with an Indian Sufi master, in which the master often mentions the difficulties in “grounding” high-frequency spiritual vibrations in a body designed for ordinary purposes. See, for example, pp. 136, 360, 362, 579, and 611. 7 For more on life themes, see the books of Sylvia Brown (e.g., Soul’s Perfection) and Caroline Myss’ Sacred Contracts. 8 InSearch, by James Hillman, p. 135. 9 9w8 = Type 9 with an 8 wing.